Shortly after the demonstration began, Interim Deputy Provost (Student Life and Learning) Fabrice Labeau came to address the protesters. He admitted to students that he had not actually read the email that had been sent to him regarding the demands of the petition, and vaguely referenced “procedure” numerous times to defend why the course could not be cancelled. In an earlier account provided by the petition, it is stated that “Fabrice Labeau claimed there was no precedent for reversing a course fee approval.” However, courses are often cancelled at McGill for various reasons, demonstrating that there are channels to do so within official procedure. The approval that Interim Deputy Provost Labeau referred to was deemed invalid by the Secretary-General of the Arts Undergraduate Society (AUS). 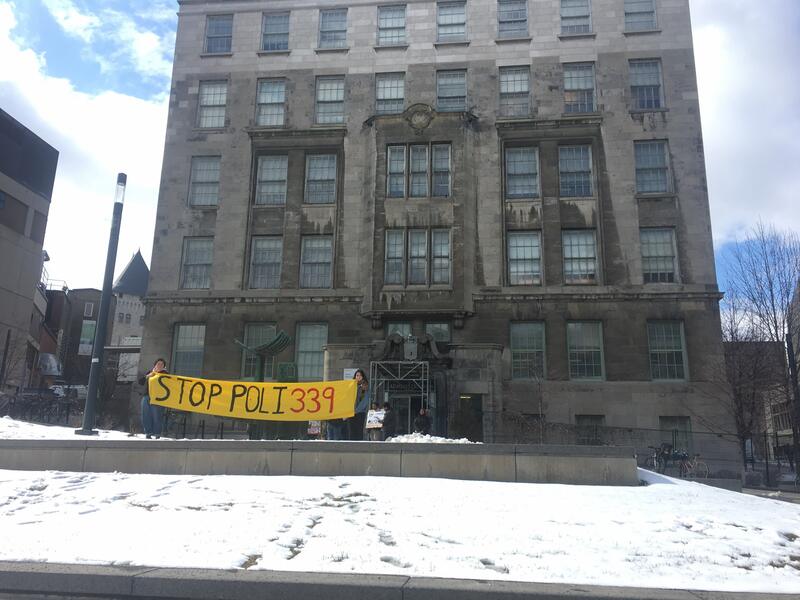 Protesters then made it clear to Interim Deputy Provost Labeau, as well as Provost and Vice-Principal (Academic) Christopher Manfredi, that if they had not read their email, it was evident the administration ultimately did not care about student concerns or democracy. The protesters then began chants, such as “Israel is an apartheid state; 339 discriminates,” “occupation is a crime; cancel POLI 339,” “are we mad, yes you bet; Suzi can you hear us yet?” and “occupation isn’t funny; students over donor money.” The sit-in blocked the front door to the James Administration Building, causing administrators to have to use an alternate entrance. At this entrance, protesters simulated Israeli checkpoints to show administrators the discrimination and harassment Palestinian, Arab, and/or Muslim students would face at the Israeli border if they enrolled in POLI 339. This detainment and harassment at the Israeli border is well-documented, with numerous cases of activists being detained, as well as marginalized folks without a history of activism. Furthermore, these concerns continue even after initially being granted entrance into the country. In addition to the sit-in, protesters handed out flyers to passersby, further detailing the discriminatory treatment marginalized students would face at the border, the illegal occupation of Palestinian land by the Mount Scopus campus, and the donors to this course: the Gerald Schwartz & Heather Reisman Foundation, “[who] have funded scholarships for non-Israelis who enlist in the [Israeli] military.” The petition further emphasizes the impact of the course, stating, “[POLI 339] is therefore intellectually dishonest, because the source of its funding is strongly tied to the violent Israeli military occupation of Palestinian territories,” which has also been described in detail by Amnesty International. While a few people attempted to break through the protesters’ sit-in and disturb them, the students held their ground, and the demonstration continued. The protest went on until 5:30 PM, at which point the group disbanded.